Although other members of the Royal family had travelled by rail, especially Prince Albert, it was not until 1842 that Queen Victoria recorded her first experience aboard a train. This was quite a bold step for the reigning monarch considering the poor safety record of this form of transportation. Hardly a week went by without some reference in the newspapers describing a railway accident and the death or injury of passengers. The saloon we travelled in, on the train was very large & beautifully fitted up. 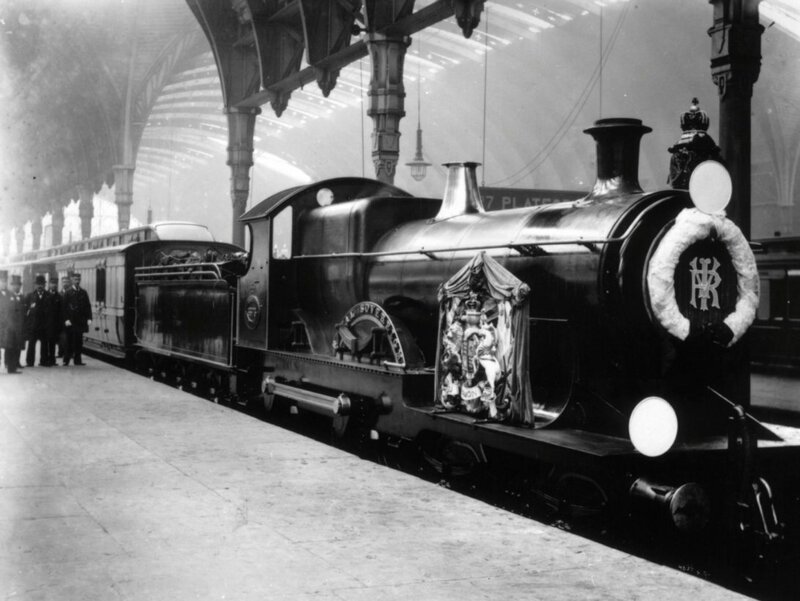 It took us exactly 30 minutes going to Paddington, & the motion was very slight, & much easier than a carriage, also no dust or great heat, -- in fact, it was delightful, & so quick. We were at Buckingham Palace by 20 m. to 1. The train consisted of seven coaches, one of which was the Royal saloon. The locomotive was driven by Daniel Gooch, the chief mechanical engineer of the Great Western Railway, who was accompanied by Isambard Kingdom Brunel, the company's chief engineer. By 1842, Brunel had already designed the Clifton Suspension Bridge and the Great Western, the first steamship to engage in transatlantic service and which had been launched five years earlier. In a letter to her Uncle Leopold, King of the Belgians, dated 14 June, Victoria described her feelings about the new experience of travel by train, concluding that she was "quite charmed with it." As they left Windsor Castle, the Queen and Prince Albert were met by two boys from Eton College who presented the Queen with a congratulatory address on surviving the attempt on her life by John Francis at the end of the previous month. As the Royal couple then headed for the station, the Eton boys ran alongside the carriage back to their school. Only ten days later, the Queen and Prince Albert were once again on their way to the railway station at Paddington. Here they boarded the same saloon carriage. Both were happy to leave London where the weather had been uncomfortably hot and dry although the Queen did express some regret at having to forego "the privacy & convenience" of the Buckingham Palace garden. The Royal Train, as would be expected, was carefully monitored and cared for. Even so, it was not immune to mishap. In the first week of September of 1855 it was on its way from London to Edinburgh when it developed a series of inexplicable problems. Notwithstanding the extraordinary precautions taken to prevent even the slightest casualty, it would seem that shortly after the Royal train left the metropolis it was found that some of the axles of the carriages, especially one of the last break-van, were not in a satisfactory state. Running repairs were unable to solve the problem. In the end a man was stationed on the footboards in order to grease the axles as the train was running. As the train approached Darlington, one of the men stationed on the footboards was knocked off by a girder at a culvert bridge. "Badly crushed and mutilated" he died soon after. 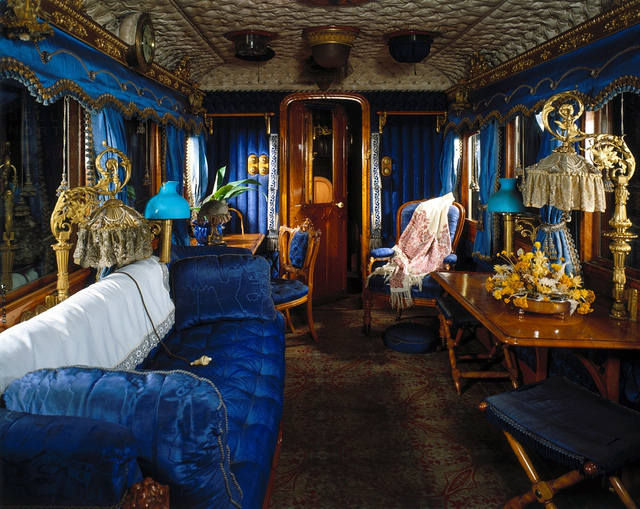 The situation was considered serious enough for the Queen and Prince Albert to be moved to another carriage, one used by other members of the Royal entourage. The Royals took to train travel like ducks to water. Initially, it was a particularly fast, comfortable and efficient means of commuting between Buckingham Palace in London and Windsor Castle. When, for example, Prince Albert needed to return to London on 5 November 1843, he took a special train from Slough to London. Royal visitors were among those who were ferried from London to Windsor by these special trains. According to W. M. Acworth in The Railways of England, whenever the Queen travelled by train, special precautions were taken. All work along the line was stopped, the points were locked, trains going in the opposite direction were halted and level crossings were closed and guarded. Within 18 months of the Queen's first trip, the use of the Royal train by the monarch had become so common an event that it was being used for longer trips. The Times reported in detail on Her Majesty's visit to Drayton, Chatsworth and Belvoir castle in December of 1843, a visit that involved a train trip of approximately 100 miles each way. The Royal carriage was, according to Victoria, "most comfortable ... all lined & furnished in light blue satin." On the same trip, they travelled by train from Chesterfield to Nottingham via Derby. Less than a year later, the Queen was on her way to visit the Marquis and Marchioness of Exeter at Burghley House, a distance of about 100 miles. Approximately half the distance was to be covered in a special Royal carriage. By now the various rail companies were vying with one-another to present the most splendid facilities. In this instance the Queen was travelling with the Birmingham Railway Company and departing from Euston station. An elegant suite had been constructed for the use of the Royal travellers, and, according to The Times, "everything was prepared to afford the greatest degree of comfort to Her Majesty." The carriage in which she and Prince Albert were to travel had been "built and fitted up expressly for her use on this railway in the most splendid and tasteful manner." In fact, there were, over the years, numerous carriages built for members of the Royal family. ...it being Sunday we had decided to start at 6, in order to arrive in London before the Service as people are so very particular about travelling on a Sunday in England, in my opinion it is overdone. Almost sixty years after her first trip by train the Queen was to ride, for the final time, in the Royal Train. She was being returned to Windsor from where she had departed on that first trip. Only this time it was for her interment. In the last few years there has been speculation that the maintenance, refurbishment and continued operation of the Royal train is no longer economical. That it makes more sense for members of the Royal family to travel by air. While there are strong arguments, not to mention sentimental reasons, for continuing to have the Royal train available, it seems likely that before long it will, like Royal yacht, Britannia, be put into mothballs.